These are terms I use to refer to people who identify as both gifted (as evaluated in school or by other testing) and as members of gender or sexual minorities: gay, lesbian, bisexual, trans*, or questioning (gay, for short). The combination of “gifted and gay” can be challenging. But finding out more about it can help young (and sometimes not so young) people and those who care about them achieve greater understanding and self-esteem. My decision to launch this site grew from the fact that increasing numbers of parents and educator groups are reaching out to me for help with their children and students. They know that I have studied this area extensively, and I am glad to consult with them. Please scroll down this page to get a little background on terms, challenges, and characteristics. GLBTQ is typical in the middle-part of the USA. In some parts of the country/world, LGBTQ is more commonly used, in references to the gender/sexual minority community. G/SM (gender/sexual minority) is also gaining some ground, because it doesn’t require that people categorize themselves. Some people just use the word queer, but that usage is considered to be insider language, so please use it only if it includes you. More letters show up all the time, to include allies, intersex people, and beyond; but the longer the acronyms get, the more explaining they require. For the purposes of this website, I will generally stick with GLBTQ: gay, lesbian, bisexual, trans* (all forms), and questioning. What do I mean by “gifted and/or talented”? Giftedness is asynchronous development in which advanced cognitive abilities and heightened intensity combine to create inner experiences and awareness that are qualitatively different from the norm. This asynchrony increases with higher intellectual capacity. The uniqueness of the gifted renders them particularly vulnerable and requires modifications in parenting, teaching, and counseling in order for them to develop optimally (The Columbus Group, 1991, as quoted in Stephanie Tolan’s essay, “Giftedness”). In my estimation, being gifted is not all about great grades, a high IQ, and high test scores. In fact, some of the most brilliant kids don’t test well, don’t conform to classroom expectations, and often don’t care if anyone sees how smart they are through whatever products of academic efforts they generate. Gifted is a state of being, not the ability to produce or behave according to prescribed guidelines. 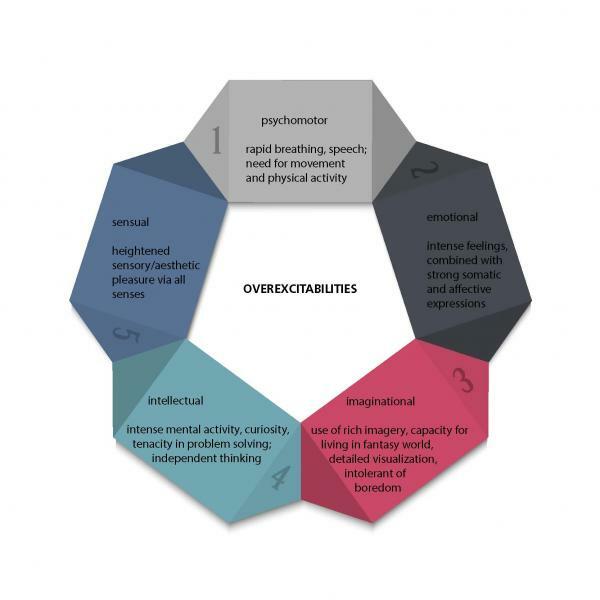 GT students often experience the effects of overexcitabilities/hypersensitivities (Dabrowski/Piechowski), which can result in rapid escalation of perceived or actual injustices, slights, and/or bullying. See below for more information on overexcitabilities (OEs, for short). Role models can be difficult to find for youth who are both gifted and GLBT. One facet or the other may be seen in prominent people, but the combination is not always apparent. *Often, college is the first environment where gifted students find true peers. Given the competitive nature of college admissions, a lower GPA (one that does not reflect the teen’s true abilities) can be a roadblock to getting into a school that would be a great fit. Research by GLSEN has found that GLBTQ students who experience harrassment in middle and high school are less likely to go on to higher education than students who feel safe at school. This is a tragic waste of potential, and it can be the cause of further difficulties throughout adult life. People who are highly sensitive to certain types of stimuli are said to possess overexcitabilities (OEs), a term rather loosely translated from the research done by the Polish psychologist, psychiatrist, and physician, Kazimierz Dabrowski. He developed the Theory of Positive Disintegration, which suggests that people who are more sensitive and reactive to their surroundings have greater potential to experience creativity and more profound levels of cognitive and emotional awareness. Several researchers (Tolan, Roeper, Jackson, and others) in the area of gifted psychology have found that these OEs occur among the gifted population at higher rates than they do among people of average intelligence. The infographic below provides some basic details. If you want to learn more, read works of Michael Piechowski, who studied and worked with Dabrowski. See the Resources for titles. If you have questions about the information you see on this site, please go to the Contact Me page and get in touch. If you would like to be a part of the conversation, please visit my Blog to share your thoughts, research, and helpful ideas.